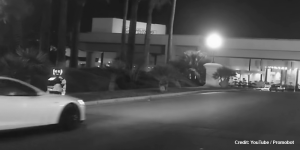 In what is now widely suspected to be a PR stunt by a company called Promobot, a video was released showing a weirdly static, but apparently stray robot on the side of an entry road into the CES carpark. A Tesla Model S drives past – very close – and the robot falls over. A man runs from the rough direction of the video to the side of the robot and appears to be establishing damage to the bot. This PR stunt earned a lot of funny headlines, but shouldn’t be taken for more than that.